Marayke would like to thank Sunshine Coast local Julia Jones Walker who raised $300 for Sporting Dreams doing her first fun run, after being inspired by hearing Marayke speak. 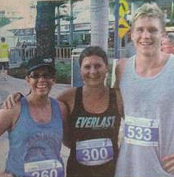 Julia co-ownes the local gym at Woombye and gathered sponsorship for the run from gym members and friends. Congratulations Julia! Can you help Sporting Dreams by fundraising for us?